Vehicle jacks are a must-have tool in any automotive enthusiast’s garage. When carrying out any maintenance or repairs it’s a convenient tool to have on hand. Deciding on which jack to purchase isn’t an easy task, however; the options are varied and depend on how and what you’ll be using it for. Floor jacks come in different shapes and sizes, some have a huge lifting capacity, others are portable, yet others are low profile. After sorting through them, we have come up with three of the best jacks on the market and a pocket-friendly option as well that’s good value for the price. Here is our top picks. Made in the US, the Hein-Werner HW93642 service jack is a 2 ton jack that is built by a leader in the manufacturing of hydraulic floor jacks. The Shinn fu Company previously known as Hein-Werner has kept up with its high-quality products that it is famous for. Undoubtedly the best car jack, this service jack can last a lifetime and if need be, can be repaired easily. Built with sturdy materials, it is the standard for car jacks. Using it is effortless, it is designed for a smooth operation thanks to its U-Joint release mechanism that also allows you to precisely control your load. The Hein-Werner HW93642 is fully built using steel; this makes it strong and sturdy to handle even a 2-ton load with ease. The side plates have been flanged to prevent any flexing and make it more rigid. Due to its minimum lift height of 4.5 inches, it is not really a low profile jack, however, that height is quite good for this large size jack. It unfortunately doesn’t have any padding on its one piece saddle which is shaped like a rounded corner square. To improve its non-slip capabilities on the lifting points of a car it has notches on all sides. In order for you to move and position this jack around easily, it has large front wheels and the rear casters can turn 360 degrees around. Since it is built with steel it is quite heavy. If you need to carry it, remove the lifting pole and lift it by its front axle. This jack is designed with a one-piece steel lifting pole that can easily be removed, this makes it quite rigid as compared with other jacks. It has one hydraulic piston that is well sealed to prevent dirt and debris from getting in and causing any damage or polluting the hydraulic fluid. In between the lifting pole socket and the hydraulic valve is a universal joint, this assists you in operating the hydraulic valve. A safety overload valve is present to prevent the use of this jack for lifting higher loads than the rated capacity. Check that the weight of the car you want to use the jack with to make sure it is within the maximum capacity and that the jack’s profile allows it to safely fit under the car. Ensure you go through the owners manual to familiarize yourself with the jack and its components. Recognize the potential risks that come with using the device. Place the handle into its fork and fasten the bolt. This is to prevent inadvertent removal of the handle during usage. Familiarize yourself on how the jack operates by turning and releasing the valve both clockwise and counter-clockwise. When the saddle is completely down, put the release valve to the closed position and pump the handle to check if the arm rises at once. If the response is not immediate, remove the trapped air using the bleeding procedure. If any part is worn out or needs repair replace them immediately. Lubricate the moving parts when necessary. To begin using this jack, make sure the emergency brake has been engaged. Use heavy duty chocks on all the vehicle wheels that are not being lifted in both directions to keep the car from moving. Find the release valve and close it by turning the lifting pole clockwise until you can feel a firm resistance to any further turning. This motion will close the hydraulic valve making it ready to lift the load. Locate the position of the car that is approved for lifting and point the jack at that place. Once the saddle is close to the vehicle underside center it to fit perfectly. Pump the handle until the vehicle reaches your desired height and place jack stands that are appropriately rated to support it. Pump the handle to raise the vehicle high enough to clear the jack stands. Remove the jack stands carefully and clear all tools from under the car. Turn the lifting pole counter-clockwise but only up to a half of a full turn to open the valve. This position lowers the load. The further you turn the handle, the faster the car will be lowered. To maintain control as you lower the car, don’t lower the car quickly. After the car has been completely lowered, remove the car jack and push its saddle down to reduce any exposure to rust, dirt or debris. Bleeding is also known as venting the trapped air. When air is trapped in the hydraulic system, the jack won’t respond as fast as it usually does and the handle won’t feel firm. Turn the release valve into the open position and lower the saddle until it is completely down. Find the oil filler screw and remove it. Once this is done, pump the handle with about seven strokes. The pressure will remove any air that is trapped in its reservoir. To finish up, confirm that the oil level is right and fasten the oil filler screw back. The Hein-Werner HW93642 service jack requires many strokes for you to get to its maximum lifting height. This is the price you pay for its smooth operation, which is the ability of this jack to carry its rated lifting capacity easily without incessant breaking down while in use makes it a safe tool to use. Though not cheap, it is the best quality 2 ton jack and is assembled in the US. The Arcan XL20 service jack is a hydraulic jack that is versatile and can lift vehicles that weigh up to 2 tons. It is compact and has a sleek low profile design that is suitable for sports cars and others with low clearances. Built with high-quality materials, this car jack is durable and is made in the US. Manufactured by the Arcan company with a track record of superior professional products, the XL20 is no exception. Although it is a quality product, the Arcan XL20 is relatively cheap compared to its competitors. Max lift height: 18.1 inches. Dimensions: 26 x 6.3 x 13.2 inches. This model is made with steel material and is covered in a glossy black paint that enhances its look and is chip and stain-resistant. Its handle is covered with foam and has all its edges rounded to prevent damage to the body of the car. These features also ensure it is not susceptible to unwarranted wear and tear making it quite durable. Its casters are made of steel and it has a rubber pad that is fitted at the part that has contact with your car. This protects and cushions the car when doing any lifting operation. Although most service jacks have one pump, the Arcan XL20 service jack has a dual pump that makes lifting a fast affair. This rapid lifting feature makes it easy to use with only a couple of strokes. It also has a universal joint release mechanism that gives you precise control of the arm whenever it is needed. A safety valve is also included for the prevention of damage to the pumps and overloading. At only 67.2 pounds in weight, the Arcan XL20 is a sturdy car jack, and its heavy duty steel gives it the strength to operate without buckling under the pressure. With its compact size, it can fit in tight spaces, function well with low clearance cars, and it fits well in storage. Additionally, its size makes it easily portable. Its casters are built using steel as well that make it durable, unlike the aluminum kind. Based only on its looks, this model appears expensive but looks are deceiving. It is beautiful and affordable. And, at its price you won’t find another car jack that is as durable or that has as many features. It carries out its task of lifting 2 ton loads while doing it with ease and with a glossy finish on its body making it an ideal car jack. It offers all this value yet adheres to the highest standards for jack lift safety. The Arcan XL20 has a limited one-year warranty that only covers factory defects on materials or poor workmanship. The warranty will not cover damage done to the jack from misuse or even wear and tear. To start using the Arcan XL20, press the lock on the upper handle as you simultaneously attach the lower handle. Keep on rotating it until they lock in the in the hole on the lower handle lock. Now, insert the handle in its socket by rotating it until it firmly fits in its place. Unscrew the handle bolt completely for it to fit well, once it does, secure it in by tightening the bolt. During the transporting and shipping of the jack, air might get trapped in the hydraulic system causing the pump to feel weak. Follow the steps below to bleed it. Twist the handle arm in a clockwise direction until it is completely turned. Then rotate it back 360 degrees twice in the counter-clockwise direction. Perform about 15 strokes of the pump. Rotate the handle in a clockwise direction until it is completely firm and perform pumps until it reaches its maximum height. Continue performing these steps until all the air in the hydraulic system has been purged. Twist the handle in a clockwise direction until it feels tight. Place the jack under the car and pump the handle for the arm to raise up. When the saddle at the end of the arm is close to the underside, position the jack for firm contact. Then proceed to raise the load to your desired height. Place some jack stands in a position to support the car safely. Once they are in place, turn the handle counter-clockwise in a slow manner, this lowers the jack and the load onto the jack stands. Operate the jack to raise up the load to clear the jack stands. Remove the jack stands away from the vehicle and area where you are working. Turn the handle in a counter-clockwise direction slowly until the car is firmly on the ground. Continue until the car is off the saddle and remove the jack from the load. Make sure your hands and feet are away from the hinges of the jack. Unlike the Hein-Werner HW93642 service jack above, this Arcan XL20 doesn’t lift as high and comes with a one-year warranty. There have also been some reports from customers on inconsistencies in product manufacturing. The Nesco 2203 floor jack is built using aluminum and features a low profile with a long frame. This makes it easy to carry around and use with vehicles that have a low clearance. It also has an impressive lifting capacity of 3 tons and a saddle diameter of 4.5 inches. This gives it the highest capacity among our top picks this is despite it being built using aluminum. So if you have a heavy vehicle or simply just love the extra capacity, this is your ideal jack. Built as a high performance tool like the rest, it adheres to high-quality standards and is a prime tool for both DIY enthusiasts and professional mechanics. The Nesco 2203 floor jack comes with an overload bypass valve that prevents overloading. It has a wide front wheelbase that makes it sturdy enough to lift those heavy duty capacity loads. Max lift height: 19.25 inches. Dimensions: 31.7 x 14.5 x 7 inches. It is built with high-quality aluminum alloy and with stainless steel finishes. It has a low profile design that is compact and allows it to access cars with extremely low clearances. The sturdy build of this tool makes it able lift 3 ton car weights with ease while having a sleek design. Its entire body is either painted blue, plated or has stainless steel giving it a nice look. The aluminum alloy build makes it light in weight weighing a mere 58 pounds. For anyone who has been using car jacks for a while, moving them around is a struggle because of their heavy steel bodies. Not so with the Nesco 2203, it has a lightweight aluminum body that is a joy to move around. Its compact design is aided by its small size and long frame that makes it fit into small fit areas and makes storing it easy. The Nesco 2203 features a dual plunger that reduces the amounts of strokes and hence effort needed to achieve its maximum height. This makes for a smooth action when performing lifting operations. Its rear casters are made of aluminum alloy that allows it to be moved around easily in the garage. Fitted on the end of its arm is a built-in rubber pad that protects the underside of the vehicle and cushions it when lifting or lowering. When assembling this model, the process is very easy. It comes in only three pieces of which two are for the handle, the other is the main jack frame. No tools are needed for the assembly, simply fit the two pieces of the handle together and insert them into the main frame and rotate it until you hear a click that indicates it’s in place. Once this is done you are ready to go. Although the Nesco 2203 floor jack is built by a US company, the actual manufacturing takes place in China. However, this isn’t to say that it is necessarily poorly made, on the contrary, this product is built to the highest standards. But by being made outside the U.S as compared to its competitors puts it a disadvantage. The Liftmaster hydraulic trolley floor jack is an incredible car jack and the fact that it costs under $30 makes it even more awesome. For its price, this jack carries out its task well, though a look at its construction will let you know that it is a bit cheap. It has a heavy gauge steel body that gives it the strength and makes it durable. Its saddle offers a 360 degree swiveling to ensure it has a good contact on your vehicle’s underside. Max lift height: 13 inches. Dimensions: 17.7 x 5.5 x 7.9 inches. 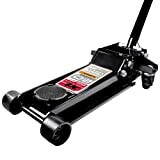 The Liftmaster hydraulic trolley floor jack is light in weight that makes it easy to maneuver it around a garage. Its has a jack pad that is about 2.5 inches in diameter. Its body has a rust resistant finish that enhances its durability. As the saying goes: “you get what you pay for,” and at $30, the Liftmaster hydraulic trolley floor jack is a powerful jack that operates as desired, but leaves a bit to be desired. It has some small quirks, like it requires a screwdriver to twist a screw slightly in order for the jack to lower the load down. This is unlike the operation of the above jacks that simply need a twist of the handle. Crawling down to releases the hydraulic release every time can be a bother. When buying a floor jack, this is the most important element to consider. It determines how much weight a jack carries and whether it will be adequate for the weight of the vehicles you’ll be working with. Buy one that will be capable of handling the weight of all your vehicles. To choose one, check that the specs and review the maximum lifting capacity it has. Ensure it is equal or higher than the weight of your car. Although when using a floor model you never end up lifting the entire car, choosing the total weight will give you enough margin for error. Using it to also change heavier cars is a plus. The maximum rated capacity is always indicated clearly and is usually greater than what it can actually carry. As usual the larger the capacity the more expensive the jack, so don’t rush for the largest instead choose one within the range of your car. Most jacks come made with either steel or aluminum. For heavy duty stuff, such as mainly using it in your garage or workshop with infrequent carrying around, opt for a steel body material. Steel is durable and will last longer than any other material out there. However, if you require a portable car jack that you can carry around easily, go for the aluminum finish. Two profiles exist for floor jacks: standard and low profile. The purpose you are using the car jack for will determine which option you should go for. If you own a sports vehicle only a low profile jack will do. It allows for low clearance vehicles, unlike the standard one which is used for standard clearance vehicles. These tools encompass a wide range of maximum and minimum lifting heights. Each tool has its own range which varies a lot. When lifting a car that has huge tires and is high off the ground, you will need a jack that has a high maximum height. Make sure that you get a car jack that is able to cater to your needs. Convenience is always a key attribute when selecting a tool. Having one that takes the fewest strokes to lift a car to the required height for changing a tire is the best. Most jacks require around 10 strokes to reach their top height. Currently, there are jacks that have dual lifting pistons that half the time needed to lift a vehicle. This enables you to reach its maximum lift height in under 6 strokes. Keep in mind that for some jacks, their smooth operation causes them to use more strokes. So this is something you must take into consideration. Knowing your requirements is the first step when choosing the right jack for you. Daunting as it may seem due to the large variety of options available, consider the factors shown here and you will be on your way to purchasing the best model for your needs. Always make sure you follow the recommended safety instructions that come with your car jack and replace any worn or damaged parts with authorized replacement parts only. Do not use them as stand alone tools, after you have used a jack to lift the car, support it with the appropriate vehicle stands. Most manufacturers recommend the carrying out of an annual inspection by qualified personnel to ensure it is fit for use.